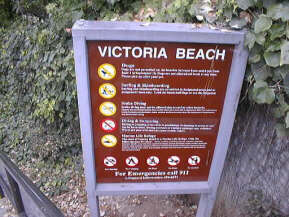 Victoria Beach is accessed from Victoria Street off of Coast Highway in Laguna Beach. From Broadway you turn east on Coast Highway heading toward south Laguna. Just Past Moss Street is Victoria Street. Keep looking for the street on the south side of Coast Highway the street is small and it is easy to miss. 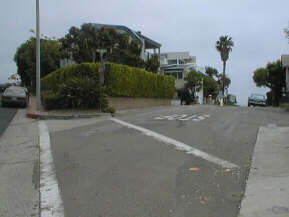 Pictured is what the street looks like from Coast Highway. Parking at Victoria Street Beach is very limited. 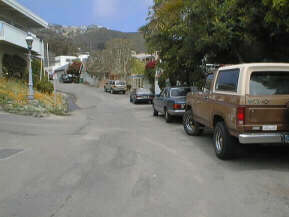 Most of the parking along Victoria Street is private residential parking. Try the full length of Victoria Street and some of the adjacent side streets to find parking also. Remember that this is a private residential area, do not park on someone's driveway or private parking pad. Get to the beach early and be lucky and you can find parking for the beach. 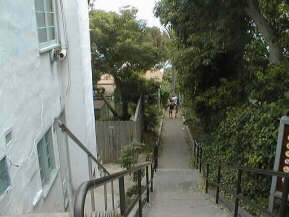 Beach Access is a staircase on the south side of Victoria street on the corner of Victoria and Sunset streets. This staircase is a shaded path that takes the scuba diver to the west side of the beach area. There are NO facilities available at Victoria Street Beach. I did see a vollyball net setup that may be a permanent fixture at the beach. There are no bathrooms, no telephone, no showers. Just the beach and diving, what else do you really need? Diving at Victoria Street is on a reef system that is right at the bottom of the staircase and extends to the west. 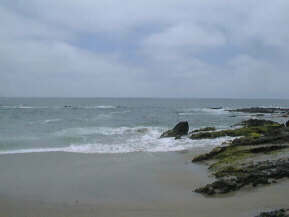 There are several small beach and cove areas along the reef. The water close to the shore is very turbulent and NOT FUN to dive in. When diving at Victoria Beach stay on the ocean side further out from the beach to help keep from getting thrashed on the rocks up close to the beach. 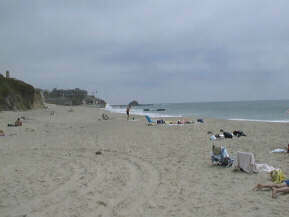 Be sure that you enter the water from the sandy beach area just east of the rocks at the bottom of the stairs.